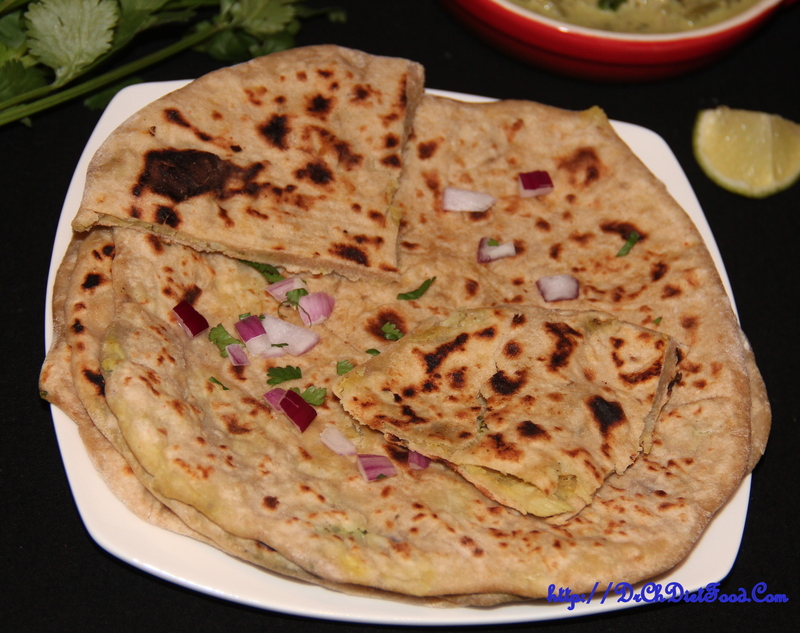 Parathas (Indian flatbreads) are very popular in India and are typically served for breakfast. However, in the Western world this is served as a side with curries, or as an appetiser. 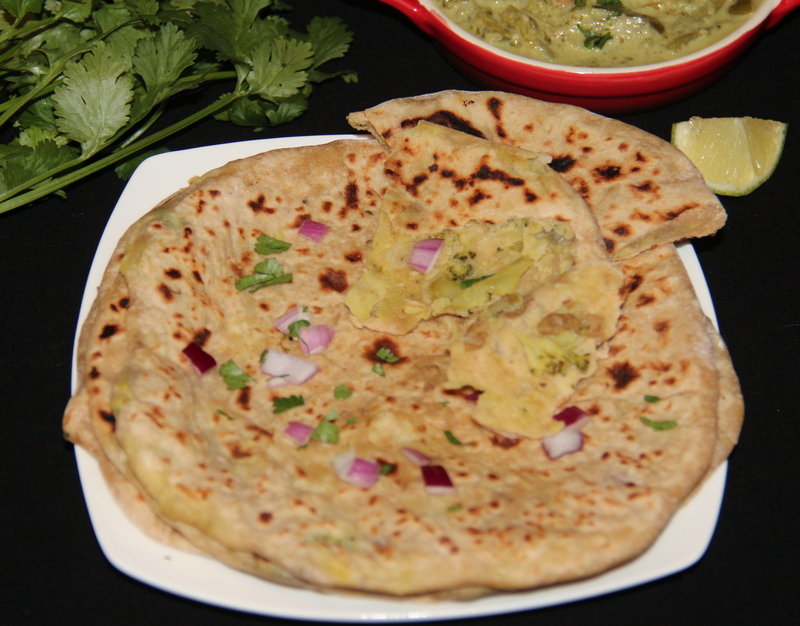 Here in this paratha I used potoato, broccoli, cauliflower as a stuffing. These parathas are the perfect start to your day. Filled with veggies, these whole wheat stuffed vegan flatbreads are sure to become your new favorite! Cauliflower and broccoli — along with other veggies, including Brussels sprouts and cabbage — make up the family of cruciferous vegetables. Cauliflower and broccoli are both low in calories. They contain glycosinolates, a family of nutrients that reduce cancer risk. Eating broccoli or cauliflower also boosts your intake of fiber and protein, two nutrients that help you feel satisfied after your meal. combine wheat flour, carom seeds, oil, salt in a mixing bowl and add water little by little and knead it to a soft but stiff dough. Divide into equal portions, cover with damp cloth and set aside for 15 minutes. Once potatoes are cooked allow it to cool a bit peel and mash and set aside. Now heat oil in a skillet, add onion and sauté until for a minute or two. Add salt, chilli powder, amchoor/dry mango powder, mashed potato and mix well until combined, simmer for 2-3 minutes in slow flame and allow it to cool a bit. Take a portion of the dough ball and roll out a small disc about 3inches in diameter and place 1-2 tbsp of the stuffing in the center of the rolled disc (make sure not to overstuff the dough) bring the edges of the dough, join them and flatten them and now roll the stuffed paraths gently to a size of a chapatti or roti. Place on the hot skillet and cook till browned and uniformly roasted on both side by brushing some oil if desired. Repeat with the remaining dough balls and stuffing. Stuffing can be personalised as per taste. Posted on April 6, 2015, in Indian, Main dish. Bookmark the permalink. 18 Comments. 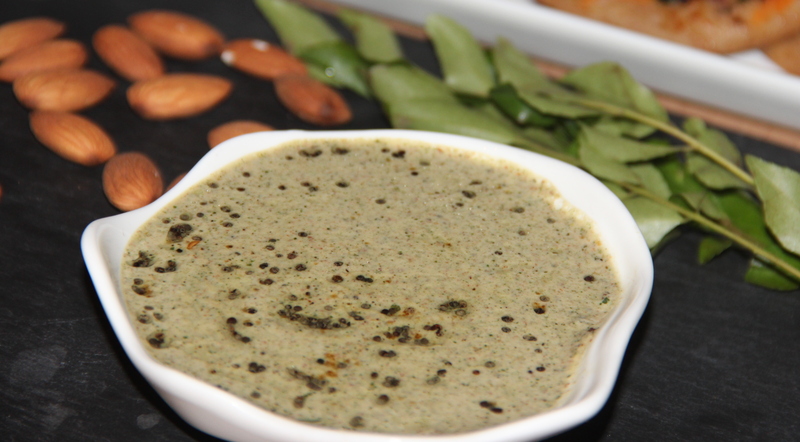 I like broccoli and I love paratha so this sounds fantastic! These look so good – one of my favourite things about being in India is the street food you can eat at breakfast time (as it resembles dishes we’d usually reserve for dinner! Very true Laura…Some dishes are so versatile which can fit into meal of anytime in a day..